The power of a single brand to sculpt, influence and inspire generations of culture is something that is hard to look past. Gabrielle Chanel created something special when she opened The House of Chanel in 1909, a millinery shop in the ground floor of a Parisians flat. 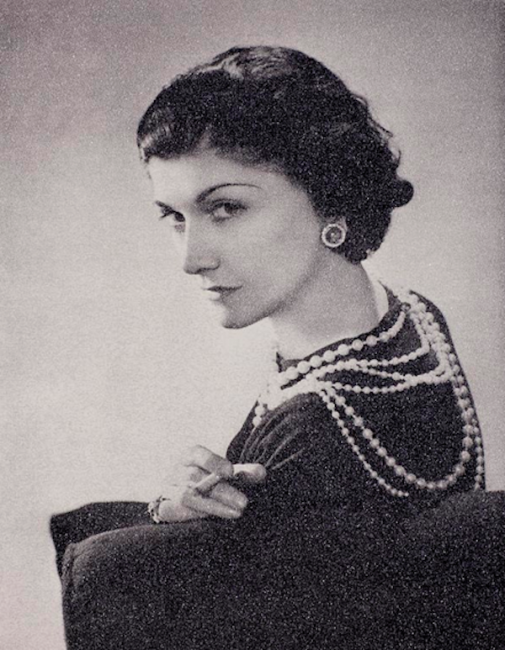 Chanel gained the nickname Coco, and as a fashion designer crated to women’s taste of elegance in a dress, allure in a perfume and simplicity that changed fashion at the beginning of the 20th century. Guy Hepner is please to present Inspired by Chanel, an exhibition featuring several works inspired by the great Chanel. Chanel is recognized as one of the most influential brands, and has expanded its influence into many areas of the creative world. Artists have drawn inspiration from the powerhouse brand ever since it was established, and have used its products, logos and simplicity to comment on many aspects of commentary culture. 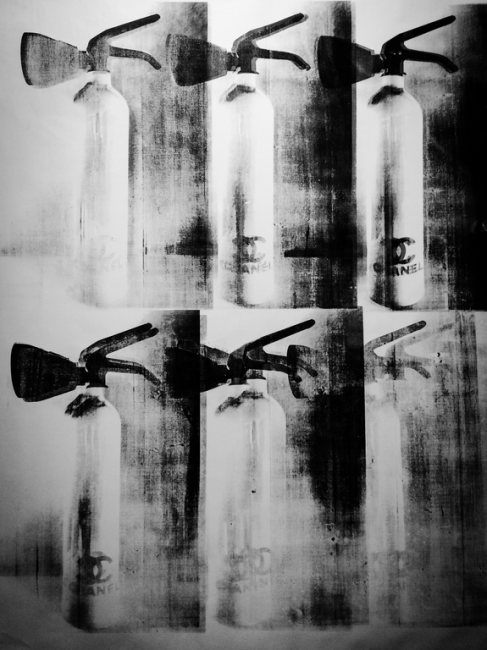 Andy Warhol’s Pop prints of the iconic Chanel No. 5 bottle may be one of the most iconic representations of the Chanel brand in visual art. As an artist, Warhol has always been influenced by his beginnings of a product marketer in which is heavily glamorized and transferred everyday objects. 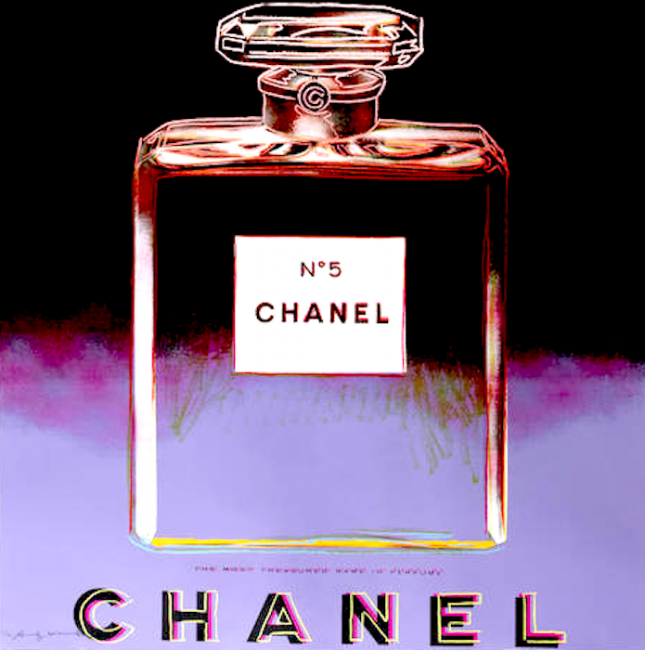 The Chanel bottle was a logical choice when completing his 1985 Ads Portfolio in which he deployed simple outlines and a limited range of colors to create a bold design. The impact of the piece is heightened by the uncomplicated composition which prevents any interruption or disturbance from other objects or colors. Jonathan Seliger’s Born to Shop series consist of uniquely hand-crafted bronze sculptures. 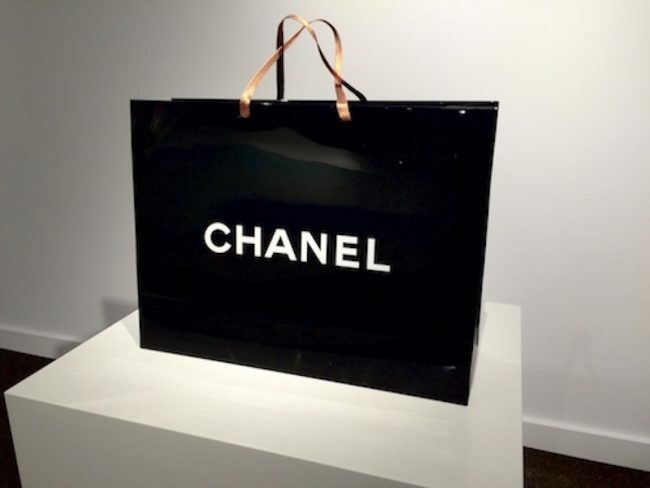 Mimicking a shopping bag, his sculpture Chanel Black succeeds in creating the illusion of having been mass-produced, thus bringing an echo of consumerism into the traditionally rarified environment of fine art gallery and museum. 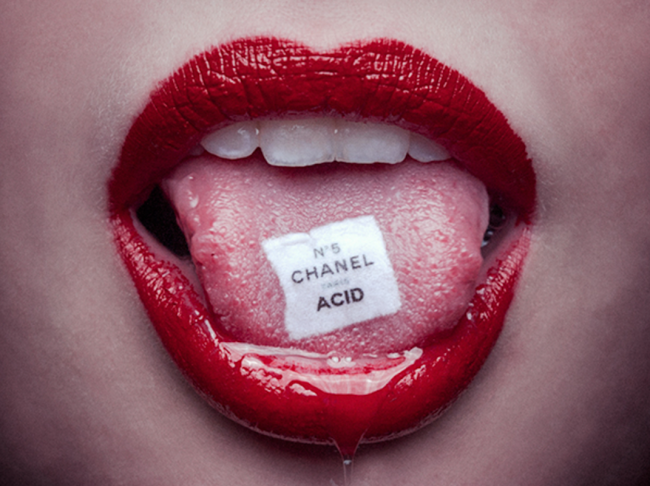 Contemporary photographer Tyler Shields has also used the motif of Chanel in several of his series. His Indulgence collection is centered around the idea of luxury and society’s sick obsession with indulging in the finer things life has to offer luxury brands. In one of most recent works from 2015, Shields plays on the addictive nature and alluring lust of the Chanel brand in his work Chanel Acid. The exhibition also includes works from artists Niclas Castello, Alec Monopoly, Russell Young and Ultavelvet Collection. 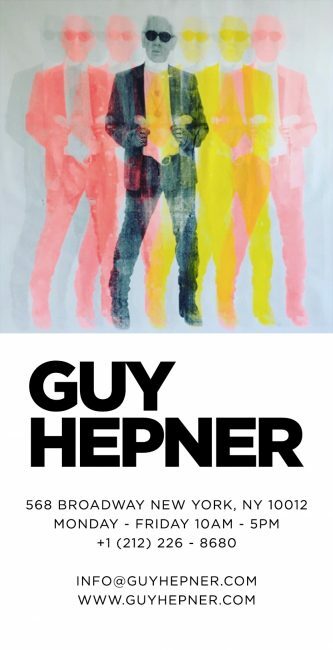 Guy Hepner is proud to present Inspired by Chanel showcasing the latest exhibition of paintings, prints and sculptures inspired by the great Chanel. For more information please inquire via phone or email.